Yes on stage at the London Palladium. Orginal drummer Bill Bruford introduced the band and joked he was the original member on stage that night. Jonathan Grierson is only nine years old, but a huge Yes fan. – I’ve been a Yes fan for several years, the young man told us. And Yes cover artist Roger Dean was more than happy to sign the 50th anniversary Yes book for Mr. Grierson. – I’ve been a fan since I was very young. The comment from Jonathan Grierson shouldn’t surprise me. After all, we are at the London Palladium at a fan convention to celebrate the 50th anniversary of Yes. And even if the average age of the convention participants is pretty high, a lot of the fans weren’t even born when the band started out. Yours truly was born four days after the band’s fifth album, the artistic peak of the band, Close to the Edge was released. No, what surprises me is that Jonathan is 9 years old! 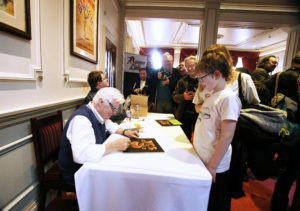 And I have just witnessed him getting the autograph of Roger Dean, Yes’ legendary cover artist. – I listen to Yes a lot, I was introduced to them via 90125, says Jonathan. – At night I always have a radio on, I listen to Planet Rock a lot and I’m also a great fan of Queen. But at my school I don’t think anyone has ever heard of Yes. It’s kind of cool to like something the others don’t. And my friends would think it is bad music. But I listen to a variety of music. Nothing modern, though. His mom, Melanie Grierson has been a fan for over 30 years and admits her son was kind of force fed Yes growing up. She attended the Yes concert the night before the fan convention but thought it was a bit late in the evening for a nine year old to be up. So Jonathan will have to wait a bit longer for his first Yes gig but it’s good to see that the recruitment of new Yes fans is still going on. 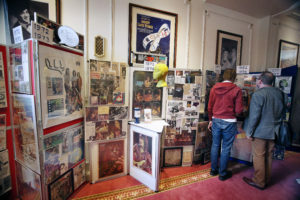 David Watkinson has collected Yes memoribilia for over 40 years. 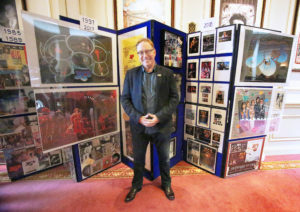 During the charity Yes fan convention at the London Palladium March 24th he put parts of it on display. However, the fan convention is by no means a bad consolation price. It was organised by Yes memorabilia collector extraordinaire, David Watkinson and Brian Neeson, the founder of Scottish Yes Network. The event is sponsored by PROG, and editor Jerry Ewing was hosting and doing Q&As on stage during the day. Tribute bands SeyYes and Fragile were also performing. Everything was done in cooperation with Yes and their management. Yes also played two gigs at London Palladium the same weekend. Both nights Trevor Horn did a guest spot on vocals on during Tempus Fugit from the Drama album. Horn was the lead vocalist on that album in 1980. He also produced their two other albums in the 80s (90125 and Big Generator) as well as their 2011 album Fly From Here. During the convention Yes also released a remixed version of Fly From Here, with Horn on lead vocals. The profits from the convention will go the Christie Hospital in Manchester and the organisation Kangaroos, that works with children with special needs. And with over 500 fans, from all over the world attending, quite a lot of money came in. Host and PROG editor Jerry Ewing is delighted when I tell him about the 9 year old Yes fan. 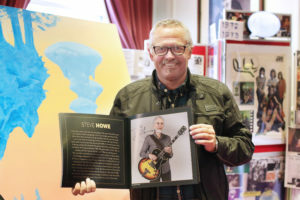 Ewing is friends with members of both bands touring as Yes at the moment (see further down for details) and was asked by their management to be host. – It’s one of my favourite bands, so I said yes. It’s also safe to say that without Yes, neither Prog nor Classic Rock Magazine, would have been started by me. They are the one of the quintessential prog band, no doubts about it. And even if I know most about the band’s history, I have to take into account that people in the audience don’t. So, I have to ask questions accordingly during the Q&As. Ewing lead several panels, one with Roger Dean and the authors of various Yes books. And later on in the day, he lead the Q&A with the whole band. Nothing Earth shattering came out of the Q&A, but the band looked be in good spirits. And vocalist Jon Davis, currently in his 7th year as their singer, admitted it was a dream come true to be in Yes. The convention was spread over two floors at London Palladium. Downstairs was the bar and the concert venue. Upstairs was a wonderful exhibition of Yes memorabilia, courtesy of David Watkinson, author of the book Yes: Perpetual Change. One of the most popular items to take selfies with was the reproduction of the mannequin head from the cover of The Yes Album (1971). But those who took the time to have a closer look at the framed newspaper clippings, got to see a lot of band history and trivia, written back when it actually happened. This is a refreshing change from reading modern day biographies that are written with the huge benefit of hindsight. – I’ve collected for 40 years, says Watkinson. – And in the pre-Internet days, that involved writing letters, sending faxes to Japanese collectors and to America and so on. It could take months from you had tracked a collectable down until you had it in the post. Another one who was delighted to be at the convention was Kevin Mulryne. He is one of the hosts of the Yes Music podcast. Over the last seven years, Kevin and Mark Anthony K from Canada (– I’ve never met him, says Kevin), have made over 300 podcasts where they are discussing Yes’ career and doing interviews with Yes members and others. You can check them out yesmusicpodcast.com. Currently they are going through all of Yes’ singles. – We have met so many Yes fans here today who listen to the podcast, and that has been very nice, said Mulryne. Personally I started listening to the podcast after speaking to Mulryne, and I have to say that I’m seriously impressed with how good Mulryne is in front of a microphone. I’ve worked in radio myself for years, and that is a good radio voice. And he never ever messes up any words. Norwegian Yes fan Lars Garde had stopped in London on his way back home from the US just to attend the fan convention. – It’s been a great experience he said. And he was fortunate enough to bump into Steve Howe to get an autograph too. The new version of Fly from Here wasn’t the only thing launched at the convention. Simon Barrow is out with a new book, Solid Mental Grace: Listening to the Music of Yes. He’s a professional writer, who also happens to be a Yes fan. – It’s about how you can tell a story about Yes from the music, rather than through the personnel changes and soap opera surrounding the music business. The book seems to have struck a nerve, because he ran out of copies and had to jot down names and addresses of people who wanted a copy of the book. During the entire convention, there was a constant line of people waiting for Roger Dean to sign books, pieces of art and of course album covers. There was also a lot of his artwork on display and to be bought. – I think I have signed around 400 items today, he tells me after the whole thing is over. We are just about to have a small chat when a record company representative comes over to talk about some problems surrounding a new Yes box set Dean has done the artwork for. (The problems referred to here ended up in the entire box set, which was curated by Jon Anderson from the other Yes band touring these days, being cancelled -Hogne). – There are always some complications, he tells me afterwards. – I remember when I came to Yes with my cover ideas for Going for the One in 1977. Vocalist Jon Anderson was painting pictures, pointed at them and told me that this was what he was after. And I basically said no. So, I didn’t make the cover for that album, even if they kept the Yes logo. Although if it’s been a bit on and off, my relationship with Yes has been going on for at least 45 years, give or take. 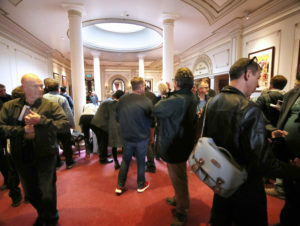 The London Palladium is a beautiful venue and over 500 people came to the Yes fan convention. The upper floor was at times very crowded because the line to Roer Dean’s signing table. On and off relationships like that are something Yes is known for. There has been a ludicrous amount of lineup changes, and the band celebrating this weekend has no original members left, after bassist Chris Squire sadly died a few years back. The current lineup is Steve Howe (guitars), Billy Sherwood (bass), Geoff Downes (keyboards), Alan White (drums) and Jon Davison (vocals). Steve Howe and Alan White, have been an integral part of Yes for most of their career, and Howe is these days in charge. However, there is also another Yes in existence. They consist of Yes founder Jon Anderson, their most famous keyboard player Rick Wakemand and guitarist Trevor Rabin, who saved the band in the 80s. 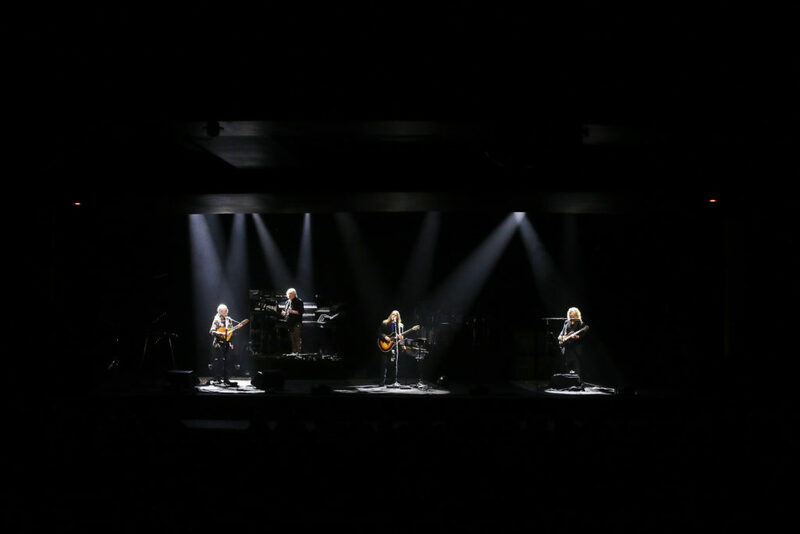 Under the monicker Yes featuring ARW they are currently touring the world, playing Yes music. None of them were at the convenion, a fact that drummer Bill Bruford pointed out when he introduced Sunday night’s gig, by stating he was the only original member present that evening… Jon Anderson was invited to the event, but he had commitments that prevented him from being able to come. – I would call it the nature of the beast, says Jerry Ewing about this situation. – It’s the music business. But as a fan I have to say that I’m happy to see two bands playing Yes music. It’s the best of both worlds. – I think Yes featuring ARW is hiding the bass in the background at the concerts. Chris Squire’s bass playing was an integral part of the Yes sound. So, pump up the bass! 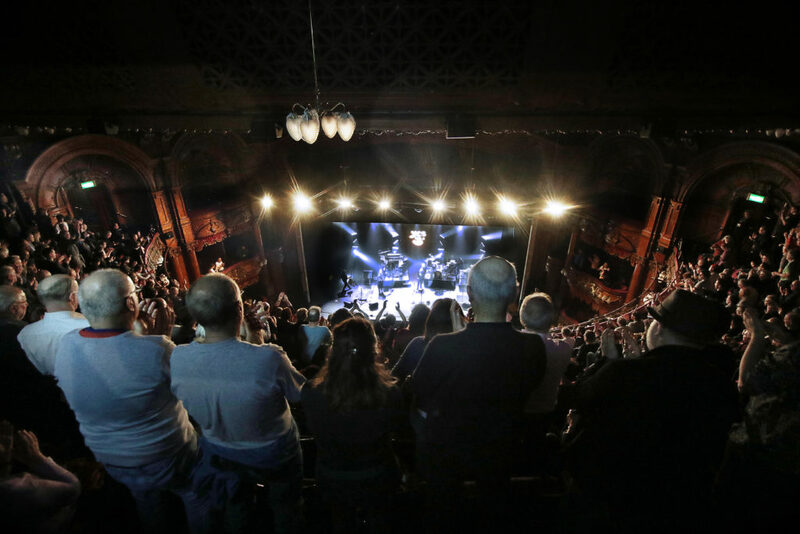 Yes are given a standing ovation after the end of the concert at London Palladium, where the band and fans gathered to celelbrate the band’s 50th anniversary.